Metallica will headline a November 9 benefit concert at San Francisco's AT&T Park for those affected by the recent wildfires in California. The metal icons – and longtime Bay Area residents – will be joined by the Dave Matthews Band, G-Eazy and more for the event that will raise funds to assist families impacted by the fires and honor the thousands of first responders. 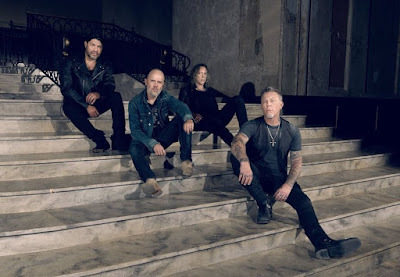 “Earlier this month Northern California, the community that we have called home for over 34 years, suffered devastating wildfires that have destroyed homes and displaced over 100,000 of our neighbours in Napa, Sonoma, Mendocino, Lake and other counties in the North Bay,” says Metallica. “We’re extremely saddened by the suffering that so many are feeling in the Bay Area, but are also inspired by the enormous outpouring of love and support from all around the country and want to jump in and help in the way we know how to - through music! “All funds from ticket sales will benefit Tipping Point Community, who have set up an Emergency Relief Fund for low-income, vulnerable communities impacted by the crisis, including vineyard workers, immigrants, displaced young people, and students. 100% of the ticket price will be donated to this fund and you can learn more about them at TippingPoint.org. “Fifth Members may purchase tickets during a pre-sale on Thursday, October 26 beginning at 10 AM, PDT through 10 PM, PDT. The public on sale is Friday, October 27 at 10 AM, PDT, both through Ticketmaster.com. Fifth Members can find their personal pre-sale code displayed on their Metallica.com profile. For more information on the event, visit bandtogetherbayarea.org. Metallica are currently playing dates in Europe as part of their WorldWired tour in support of “Hardwired…To Self-Destruct”; the fall run will wrap up in Antwerp, Belgium on November 3.